Over the 15 years we have been training people to become bricklayers, tilers and plasterers, a number of our pre-apprentice students have gone on to become apprentices. The apprenticeship process isn’t always easy! Thats where a dedicated family run trade school can help. Alex completed his Certificate II in Construction pre-apprenticeship with FCTA – Building Careers in 2012. 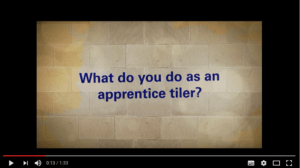 He was an excellent student who quickly decided that Tiling was the trade he wanted to specialise in. He secured an apprenticeship straight away and went on to work with 2 other employers as well. Along the way we have gotten to know Alex’s family and seen him become a top tiler. Pre-apprenticeship courses are a great way to decide which trade you want to focus on. Students try several different trades before selecting one to focus on. Often the skills from one trade are used in another. Tilers frequently brick in bath tubs and build hobs. Screeding skills that are so important in tiling are part of the hand skills used in plastering. If you are interested in completing a pre-apprenticeship course our next Certificate II in Construction starts 11th October 2016. Call us on 83675615 or email admin@fcta.com.au for more information.